In addition to wine, Tasmania has developed a reputation for making gins and whisky. Two years ago, when Sharon and I were in Sydney, we went to Root Stock Sydney – a gathering of producers who are dedicated to producing biodynamic and sustainable agricultural practices. We met Peter Bignell there representing his rye whisky made at his farm in Kempton, Tasmania. I gave him my card and invited him to come to my house for dinner if he was ever in San Diego. Lo and behold, he took me up on my offer many months later. He gets invited to speak at specialty spirits conferences. Such was the start of our friendship. Peter grows his own rye, harvests it and processes it using only biodiesel, runs his distillery on recycled and repurposed discarded machinery, generates the power with solar, and uses rain catchment for his water needs. As he said the only thing that comes into his farm are empty bottles and the only things that leave are bottles filled with whisky. Everything gets recycled. 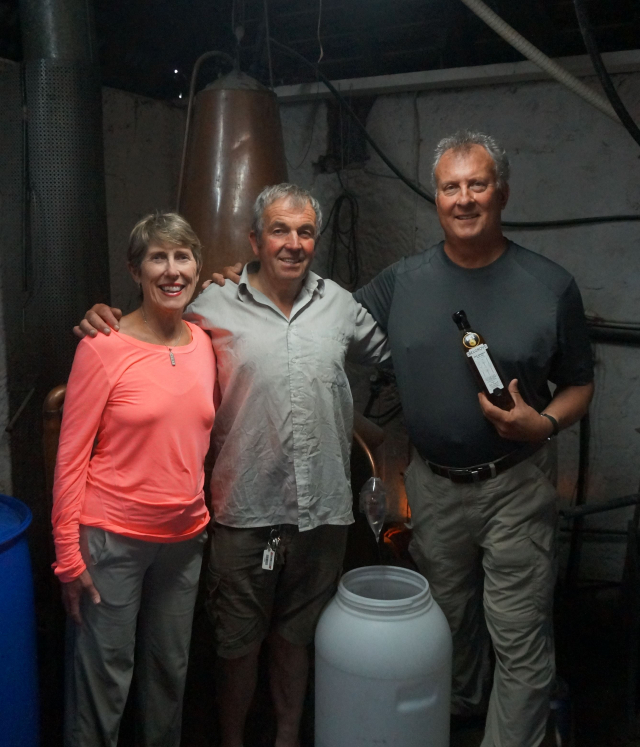 We spent a couple hours with him learning about how he makes whisky (and everything else he runs through his recycled, home built copper still that burns recycled cooking oil). We are standing in front of his still. This man is an idiosyncratic genius. There is nothing flakey about him. He is smart as a whip, knows his chemistry, and hates to waste anything.